She was fourteen when she left Ethiopia for Europe, a wee girl with hair pulled tight and piled high to make her look taller. We spot her in a group of nine girls, among eighty young men, all refugees in a mini-camp near the demolished Jungle in Calais, France. Hemmed in on three sides by green fencing with no place to sleep, cry or pee in private, watched by a CRS car, these refugees try. Just ‘try’, they say, and everyone knows they mean try all night to sneak into a truck across the Chunnel to England. This camp lacks the perks of the former Calais Jungle – schools, activities, refugee-run stalls and restaurants, hundreds of warm volunteers, and distribution sites for clothes, tents, and food. The biggest loss is tents and personal belongings. The CRS pepper-sprays nightly and destroys items that bring comfort, like tents and sleeping bags. SO this mini-Jungle is a rocky field of trash and people who harbor the suspicion of those who have been mistreated. We give the men hot tea in plastic cups, and my heart instantly sinks with the realization that we have no food, shoes, or phone credit to offer. Their hope turns to disappointment. Still they chat with their few words of English, happy to shoot the breeze with Caritas staff who come daily to check on them. I am new to this brutal mini-Jungle, the hair of the refugees big and wild because barbers in the previous Jungle of 10,000 have dispersed, clothes and faces dusty because there is no running water — that, too, vanished with the demolition of the Jungle. Moroccan Maryam crams all nine girls into the Caritas van, with the offer of clothes and a shower. On the rise to Caritas, she chats and laughs with them in Arabic, calling them “habibi” (darling). At Caritas, the girls take hoodies and jeans, laugh in the shower, eat, beat out body music. It takes repeated reminders to get Maryam to translate my instructions, worded carefully to convey healing messages at multiple levels. But it doesn’t much matter if some is lost in translation because her love is so palpable, the girls melt. The wee girl and her sixteen year-old friend teach me how to shake my shoulders in an Ethiopian dance move that requires a fine isolation of muscles. They soon tire because they didn’t sleep last night when they were trying, so we walk the pier, and buy them Tunisian dinner and ice cream at beach stands. They show us pictures of mothers and sisters on their phones. 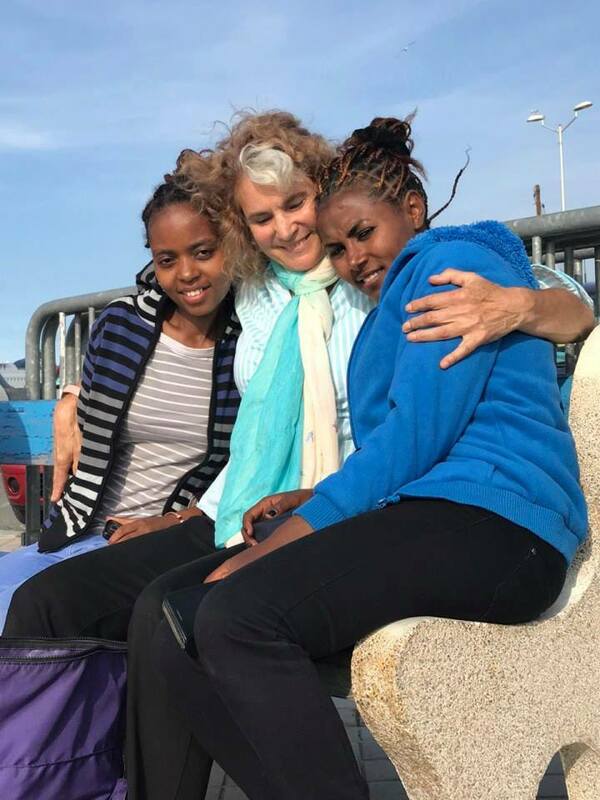 Hisham joins us, and after a brief conversation in Arabic with the slight fourteen year-old, passes along the sweetest thing I could imagine hearing: this is the first day since she left Ethiopia that she has let down her guard and enjoyed herself.